Convenient date highlighter for outlining current day of week in month and current week in blue. 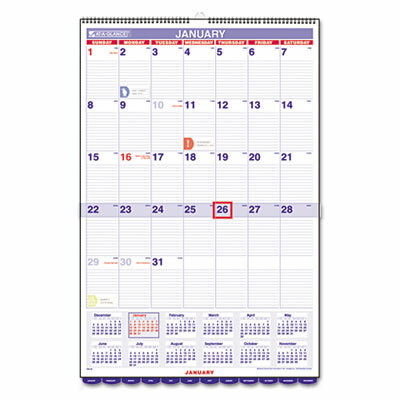 Highlighter is attached with an elastic band for smooth movement up and down each calendar page. Flag important dates and special occasions with seven colorful icon reminder stickers. Monthly tabs on bottom of page for quick reference. Convenient date highlighter for outlining current day of week in month and current week in blue. Highlighter is attached with an elastic band for smooth movement up and down each calendar page. Flag important dates and special occasions with seven colorful icon reminder stickers. Monthly tabs on bottom of page for quick reference.